If you have a good level of fitness and are seeking a fun filled adventure, then canyoning is the perfect activity for you. Push the boundaries of your comfort zone as you descend a steep valley following the course of a river. 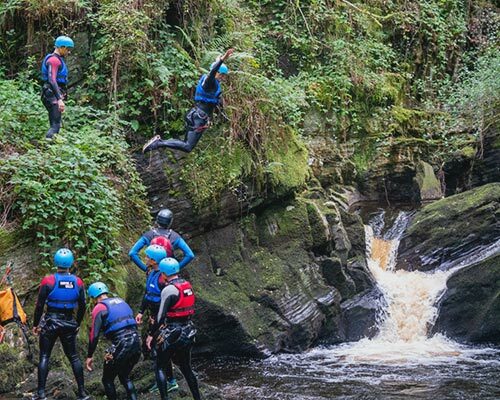 Canyoning allows you to explore the rugged beauty of some of Wales’ best canyons, as you scramble over rocks, abseil alongside gushing waterfalls and jump into deep pools. 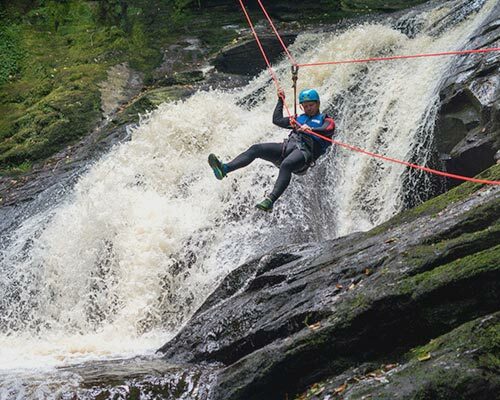 With the dramatic mountains of Snowdonia in the North and the carved limestone landscape in the South, Wales offers an idyllic backdrop to your canyoning adventure. We have a range of canyon sites available to thrill even the most seasoned adventurer. All of our canyoning sessions are delivered by a team of the best canyon guides available, whose experience, qualifications and passion for canyoning will guarantee you a 5* adventure. Our canyoning trips are a little more challenging than our gorge walks. The steeper valley means faster flowing water, higher jumps and abseils. These trips are only suited to hardy outdoory kids and teenagers, generally aged 16+ but feel free to contact us if you've got adventurous kids who want a challenge. If you are looking for something a little more technical to go with your dose of adrenaline, check out our highest level canyoning experience - these are the trips our guides do on their days off, so previous canyoning / abseiling experience is a must. We will always aim to offer you the best experience with Canyon Wales, therefore if you would like some more information about which level of trip might be best for you, please get in touch. Our canyoning trips are ideal for anyone, who has a good level of fitness and is confident in deep water. You don’t need to have any previous canyoning experience as we will teach you everything you need to know. If you would like more information about what is involved on our canyoning trips, please contact our friendly Canyon Wales team. What should you wear Canyoning? We will provide you with a Wetsuit, Wetsocks, Helmet, Buoyancy aid and Harness as well as all the other safety equipment you will require to descend the canyon. We recommend you wear a swimming costume / trunks underneath the wetsuit, as well as a rash vest or synthetic top when the weather is a little cooler. Bring a pair of trainers that fit comfortably and that you don’t mind getting wet. Then to top your outfit off choose your most flamboyant looking pair of shorts for those all important photos!